Between or Among: What's the Difference? 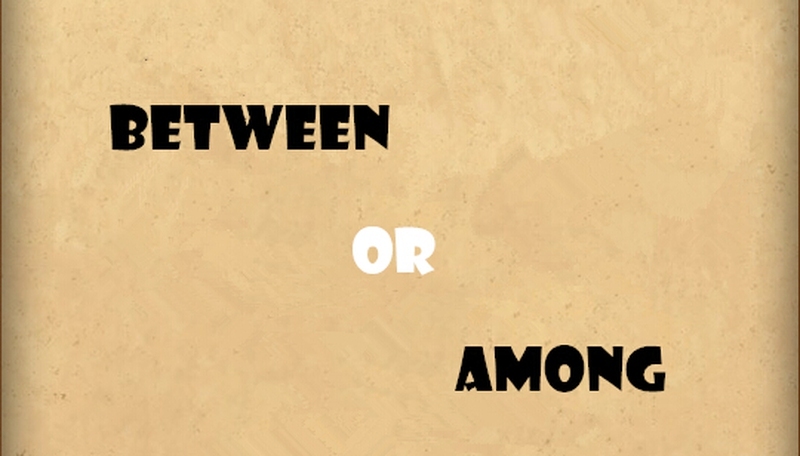 Out of the following sentences, which one uses the words between or among correctly? 1. Among the three different color choices for the new baby’s nursery, which one you like best? 2. The contract dispute was to be settled between the teachers, the students, the principal and the mother. 3. We divided the cost of the bicycle between April Sunday, Ben Knight, Joan Parks, and that woman there. 4. My husband and I discussed the wedding date among ourselves until we finally decided to go off and elope without telling our friends and family. Only the first sentence is correct! If you have a wrong answer, you must read on this article. If you have given a correct answer, you should keep reading it for getting more tips about using between or among! Our beach house is between the ocean and a very busy street. Explanation: The ocean is on one side and the busy street is on the other. The stray cat was hidden among the bushes. Explanation: The cat is surrounded by bushes. By using the basic theory people have known, you will occasionally use the words between and among correctly, but usually it is better to follow the specific guidelines set up by the grammar professionals. This marriage contract is signed between the bride and the groom. The agreement was entered into between the priest, the nun, and the president. The differences between high heels, ballet flats, and tennis shoes are significant. There is consensus among students that this approach be used more frequently. The scandal caused a riot among people. Lucy was later found living among the residents in the commune. The little girl felt like a butterfly among the beautiful flowers. People sometimes may wonder the differences between among and amongst which have the same meaning. You should know amongst is very old form and is more commonly used in Britain than in the US. The word amongst is considered old school, sometimes even being considered pretentious by American English speakers. Maybe you may only find it in a fiction that is set in Great Britain or in an old time. Is it truly safe to walk amongst the peasants without any protection, my lord? In order to find out if you are proficient in the usage of the words between and among, take this quiz to see if you can give the right answer to when to use the two words correctly. (a) Alcohol is becoming more and more popular _____ younger children. (b) As talks stalled over an impasse _____ the Israel and Iran, discontent escalated _____ the residents. (c) The differences _____ a cat and a dog are easily to see. Which one do you like? Server responsed at: 04/20/2019 6:25 p.m.